Just brewed espresso is thick and viscous just like syrup. It should be topped with a stable golden crema. It takes a couple of tricks to cook a cup of decent espresso. A barista, who works in a popular coffee house network, has shared some little secrets, which can help you cook an ideal drink. Everything is important – from quality of water through the coffee mix you are using. Coffee is 98% water, and so is the coffee’s taste. To achieve acceptable taste, you should use fresh low-hardness water. The thick tannish-gold crema topping an espresso consists of coffee oils, protein, and carbohydrates. It is the crema that makes the espresso’s basic flavor. There is one little principle: the richer a coffee mix is in oils, the less stable the crema is. Therefore, many mixes, which are intended for cooking espresso, contain a percentage of Robusta grains. They have about 10% of oils compared to high-quality aromatic Arabica grains that contain 16% of oils. Ideally coffee beans should be consumed between three and fourteen days from roasting. In the first three days the beans are still releasing carbons from the roasting process. From fourteen days the coffee will start to lose its flavor characteristics to become old and stale tasting. Store your beans in an airtight container in a cool dark place. Do not refrigerate or freeze. Blending is to combine coffees from two or more countries of origin. Espresso should be a harmonious blend of sweetness, acidity and bitterness. Espresso roasts tend to be slightly darker than filter or French Press roasts as a darker profile emphasizes body and sweetness. An espresso grind is a very fine grind yet still granular. 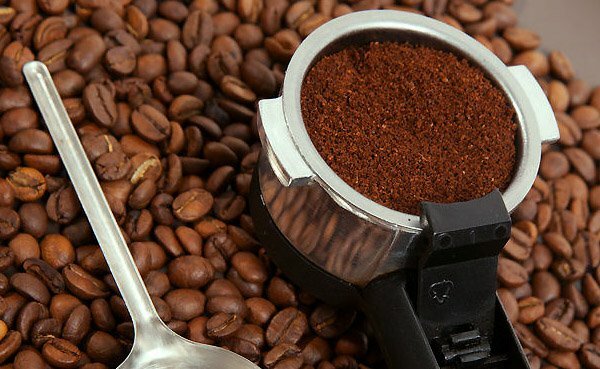 Coffee loses its flavor rapidly once ground therefore only grind as much as is needed for the next espresso beverage. Temperature, humidity and wearing of the grinder burrs all affect the accuracy of the grind setting, therefore each morning you may find you need to ‘dial-in’ your grinder (make the grind setting coarser or finer) This will be the difference between good and great coffee. It is important to have a good burr grinder with a fully adjustable grind setting. Espresso is a 25-30ml (50-60ml for a double) beverage prepared from 7-9 grams (14-18 grams for a double) of coffee through which clean water of 90.5 °-96.1°C has been forced at 9-10 atmospheres of pressure, and where the grind of the coffee is such that the brew time is 20-30 seconds. While brewing, the flow of espresso will appear to have the viscosity of warm honey and the resulting beverage will exhibit a thick dark, golden crema. Espresso should be prepared specifically for, and immediately served to its intended consumer. How to make beautiful espresso? Place fresh coffee grounds into the portafilter basket until full or overflowing. Knock the handle on the tamping mat once to settle the grounds. Evenly distribute the grounds to a level flush with the rim of the filter basket. Release any excess grounds back into the doser hopper. Compress the grounds with a tamper, pressing firmly, then twist the tamper to smooth the surface of the grounds. Tamp pressure should be around 30kg so the applied pressure should be very firm. Insert the portafilter into the group head and activate the pump immediately by lifting the brew lever. Liquid volume should be 50-60ml in 20-30 seconds (from the double handle or 25-30ml in 25-30 seconds if using the single basket. Stop the pump appropriately. Serve immediately or combine with milk to prepare an espresso based beverage. Remove portafilter and knock out spent coffee. Wipe filter basket clean and flush group head. Return portafilter to group head to keep portafilter heated. 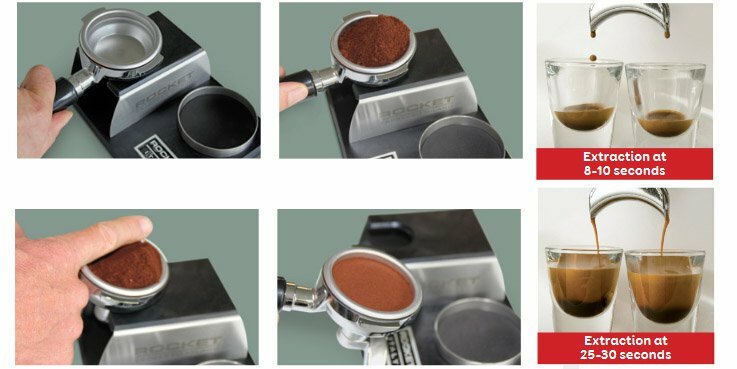 Ensure that your dosing and tamping is consistent. Good extraction is characterised by a 5–10 second delay before any coffee will pour. Heavy droplets will appear and develop into a thick, straight and even pour. The colour will be dark brown or hazelnut, preferably with a reddish reflection. The pour should be cut off before the colour lightens and the pour begins to curl in. If the flow is too fast (another sign is a pale crema and white streaks) then adjust your grind to make it finer. The finer the grind the slower the extraction. The coarser the grind the faster the extraction. If the flow rate is too slow, adjust your grind setting to make it coarser. Correct grind equals correct extraction equals correct flavour. Half fill your stainless milk jug with fresh cold milk. Use a 250ml jug if you are preparing milk for one milk coffee. Use the 500ml jug if preparing two milk coffees. Purge the steam wand of condensation by quickly releasing steam into the atmosphere for a few seconds. Place the steam wand nozzle just under the surface of the milk and to the side. Turn the steam pressure on fully. You should hear a sipping type sound which is the sound of the milk increasing in volume. The milk should also be swirling in a whirlpool motion which folds out the air bubbles and improves the texture of the heated milk. Keep the jug steady so that large bubbles do not develop. You are aiming to stretch the half a jug of milk to three-quarters full and to have a dense and satisfying microfoam texture. Turn off the steam pressure when the milk is about 65° or the milk jug is just too hot to touch. Remove the milk jug, clean the steam wand with a wet cloth and purge the wand of any milk residue. If there are any large surface bubbles, give the jug a heavy knock on the bench. Swirl the milk jug in a circular motion to reveal a gloss-like appearance. The milk is now ready to pour. Do not delay or the texture will separate in the jug. 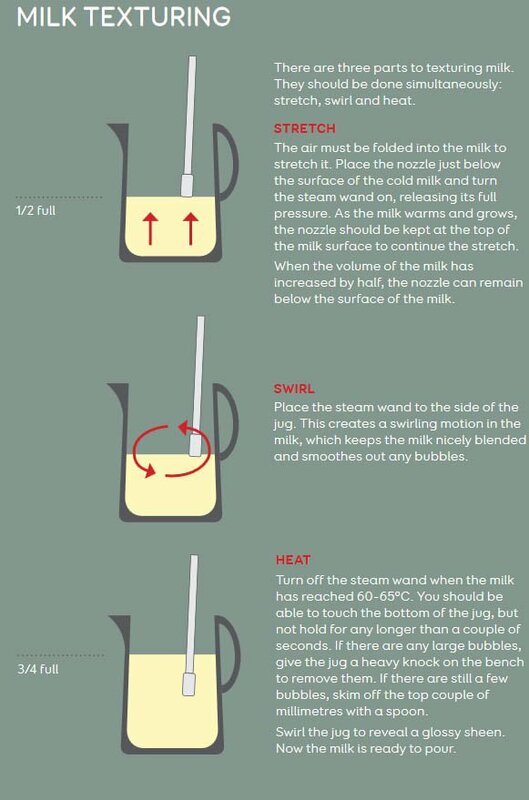 How to pour heated milk? Start by pouring the heated milk gently into the centre of the crema ensuring that the crema stays intact. 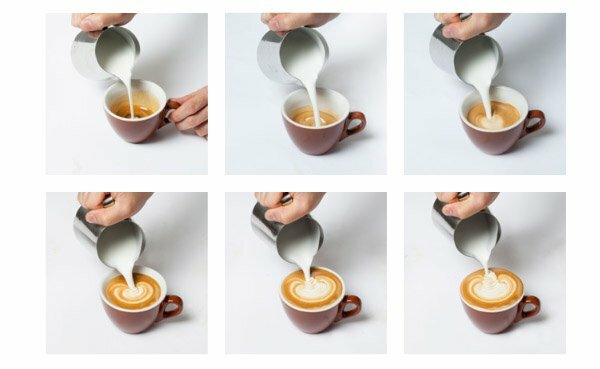 Once the espresso and milk is nicely combined and the volume in the cup is about half full, speed up the pouring process by taking the spout closer to the cup and increasing the angle on the pour. Keep the jug as close to the surface of the beverage as possible. Rock the jug side to side to release the heavier textured milk into the cup. 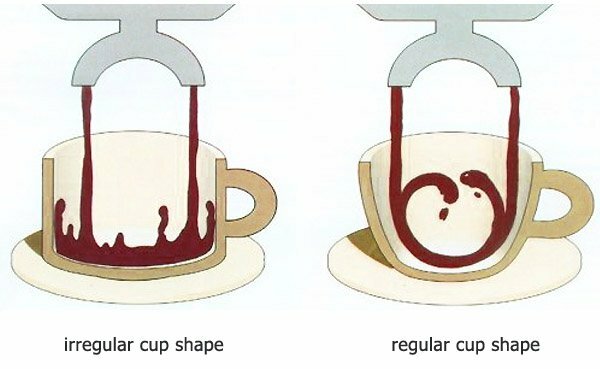 This is how one creates shapes and patterns in the cup.